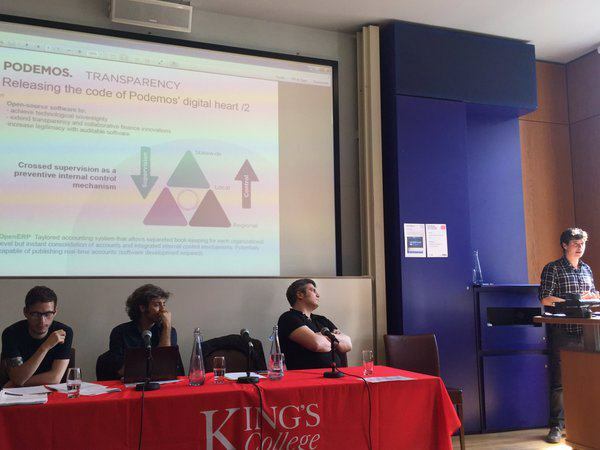 La conferencia #Cyberparty, a la que han asistido 250 personas, ha sido organizada por el Centro de Cultura Digital de el King’s College de Londres para explorar cómo utilizan los nuevos partidos políticos las tecnologías de comunicación como medios para construir nuevas formas de participación política y de organización en un contexto de desafección política generalizada con la política convencional. Para ello, se han reunido en la capital británica expertos y activistas de la vanguardia en la innovación política. Durante el encuentro, los participantes han debatido sobre los diferentes aspectos de los nuevos partidos digitales: sus formas de comunicación, sus plataformas de toma de decisiones; su plataforma política y su base social. Desde Podemos, han participado Miguel Ongil, diputado de la Asamblea de Madrid, y experto en transparencia y anticorrupción, Francisco Jurado, Secretario de la Vicepresidencia III del Parlamento de Andalucía y experto en participación, y Sofía de Roa, técnica del área de finanzas y transparencia de Podemos y promotora de Sistemas de Indicadores de Calidad democrática en partidos políticos desde la Asociación Calidad y Cultura Democráticas. Is the political party making a digital comeback? How are digital parties from the Pirate Party, to Podemos and the 5 Star Movement different from industrial parties? How do they reflect the digital communication ecology and the changing forms of social experience in a digital society? Digital parties raise new demands about a number of new issues that reflect the new conflicts and forms of life and social experience of a digital society as seen in demands for Internet freedom, privacy, transparency, for basic income and for freedom to be put at the service of collective good. The panel will explore to what extent these emering demands prefigure a new digital cleavage beyond the industrial cleavage that separated socialist and conversative parties. Digital parties introduce several innovations in forms of organisation, many of which are strongly informed by the doings of recent protest movement, their use of digital media and their participatory ethos. This panel will discuss the relationship between movements and parties and the new organisational models that emerge at their crossroads, debating the nature of emerging forms of leadership and coordination, of verticality and horizontality. Digital parties are well known for their pursuit of the idea of direct democracy and for their use of various online decision-making platforms to discuss and vote on policies and candidates. These practices prefigure a return in a digital form to mass participation in poltitical decisions. But to what extent are these plaftorms and processes truly democratic? And when will they enter the political mainstream? The diffusion of digital media has profoundly reshaped the experience of political participation and the very space in which people come together to take part in political processes. This has not meant a doing away of face-to-face interactions, but rather a complex intertwining of the online and offline. This panel will look at the changing environment of political participation by looking at the practices of internal participation of various emerging movements and parties from Spain and Eastern Europe. It will ask how the meaning of participation and party participation is changing in a digital world. Closing Plenary: Between crowds and Parties: Digital Communism or Techno-Populism? What kind of politics should digital parties pursue? Is communism, anarchism, or leftwing populism the most credible direction for an emancipatory politics in a digital age? And how do these different ideologies and political imaginaries configure different political directions to deal with the new conflicts that are emerging in a digital society?